In “Green, a Dead End for Social Networks?”, I continue to question the legitimacy of green social networks, even going as far as suggesting that they be abandoned altogether. Instead I propose a non direct approach to go around the ‘nice to have, but don’t need’ problem of green social media in general. One example could be a site that helps people manage their personal resources more effectively as food and gas prices continue to rise. Conservation and efficiency measures would obviously be featured prominently on such a site, but always first as a way to maximize personal resources, and only secondarily as feel-good green measures. Another alternative is to treat green as what it is, a qualifier for all aspects of people’s lives. This is in sync with growing green narrative: green economy, green revolution, green jobs, green media, green homes, green cars, green living, etc. It is also aligned with the psychology of most people, for whom green is only a secondary benefit. Using that logic, it makes sense to not have separate green social networks, but instead green applications that come as a layer on top of existing mainstream networks. Imagine if you had the option of going green on YouTube, LinkedIn, Twitter, Facebook, Google, Amazon, Craigslist, eBay . . . seamlessly, at your discretion? At the heart of both approaches, “roundabout green network”, and “green layered network”, is the recognition of green as a global necessity of the highest order, to be reconciled with the fact that it is only a secondary benefit on the personal level. Reminding us once more of what behaviorists have known for a long time. Consequences, not admonitions, are most effective at changing behaviors. 67% of voters believe that drilling should be allowed off the coasts of California, Florida and other states. 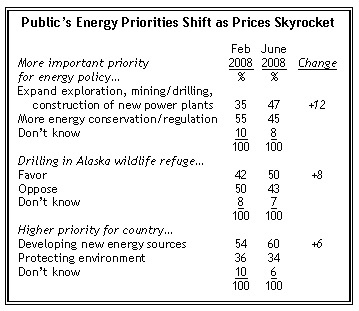 Amid record gas prices, public support for greater energy exploration is spiking. Compared with just a few months ago, many more Americans are giving higher priority to more energy exploration, rather than more conservation. An increasing proportion also says that developing new sources of energy – rather than protecting the environment – is the more important national priority. Al, it’s not going to be easy convincing your fellow American citizens . . . Also, what happened to conservation? How come the ‘C-word’ does not appear even once in your interview? Did I miss something? These past two weeks spent traveling in France and Italy convinced me even more about the role of culture and society in shaping individual behaviors. Most interesting was to observe how both I and Prad adapted our behaviors to fit the different customs in each country. Prad, who usually protests vigorously the slightest whiff of cigarette smoke back home, thought nothing of taking strolls on the smoke-filled Parisian sidewalks. In Italy, we quickly learned to conform to the practice of drinking bottled water at the restaurants. Two examples of the power of social norms, relative to individual environmental choices. This raises the question of how to bring changes in normative behaviors, that will support sustainable lifestyles, across cultures. According to Horne, “New norms are thought to emerge when costs of compliance with existing norms become too high relative to the rewards“. Montgomery weighs concerns of costly normative actions against concerns of morality or social opinion. Though unlikely to change their behavior when norms become costly, individuals will praise those willing to do so; after a few have tested the waters, a domino effect of individuals who harbor less fear of social sanction will follow. If these innovators receive social approval, individuals will continue to participate in new strategies in order to gain recognition. Christakis‘s research similarly points to the social nature of behavioral changes. On the green front, several trends are emerging that should give us hope. First, is the growing acceptance of the idea of green as universally cool and no longer the claim of a few treehuggers. The social sanction for behaviors such as biking, recycling, carpooling, using mass transit, recycling, to name just a few, has tipped towards the positive. Concurrently, rising gas and energy prices, are making it harder and harder for people to maintain their old behaviors. SUVs, boats, superfluous driving no longer make sense for the majority of Americans. Other adaptive behaviors are stirring, as in urban gardening, and driving more slowly. First, are opinion changing strategies, including all mass media and communication campaigns. Every green drop counts. What I write here in this blog. What you write, either in your own blog, or as a commenter on others’ blogs. What you say in casual conversations to your friends and coworkers. What you ask from your elected representative. What you communicate through your example, as in here and here. What the “we” and the “Together” people do. What Barack Obama, and other leaders declare is important. What the New York Times, and the rest of the press put on their front page. What Arianna Huffington chooses to promote. It all matters. Second, are cost raising strategies, in relative terms, either through the offering of new, lower cost options, or the raising of the costs of existing options, whether volitional or not. Rising gas and energy prices are an example of the latter. And so are various forms of carbon tax. Smart technologies such as more fuel efficient cars or home energy efficiency solutions work on the other end, through the promise of higher financial rewards, and social acceptance. 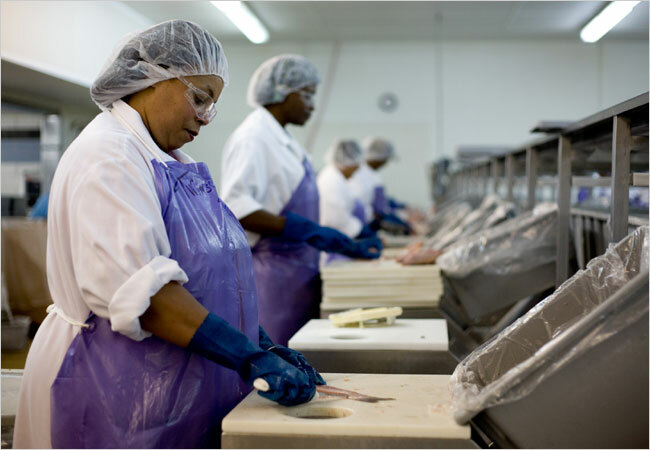 Third are direct behavior shaping strategies such as evolved from Pierre Chandon‘s research. Chandon‘s study, ‘When Does the Past Repeat Itself? The Role of Self-Prediction and Norms.‘ tells us that ‘by predicting our behavior, we can actually reinforce good habits and break bad ones‘, a sophisticated twist on the power of self-fulfilling prophecy. What this means for our problem, is that by asking people such simple questions as ‘Do you bike, do you carpool, how often and how long do you walk, do you turn off your lights, do you hang your clothes to dry, do you eat fresh food?’ chances are it will increase the likelihood of them engaging in these behaviors. Conversely, by not mentioning other negative behaviors such as driving, using dryer, eating processed food, etc, they will be less inclined to perpetuate those. This is just the beginning of a long list. My main point is, thought leaders on climate change and other global environmental issues with a human factor component, need to spend more time exploring such behavior shaping strategies, based on the available body of research on normative behaviors. Americans are clueless, and most politicians prefer to keep them that way. James Kunstler put it more flamboyantly a short time ago, saying that “The fog of cluelessness that hangs over North America about the gathering global oil crisis and its ramifications seems to thicken by the hour.” Not long ago I saw a bumper sticker that said, “Why is Our Oil under Their Soil?” Though it cannot be found in our constitution, Americans assume that the right to cheap gasoline is one of those “unalienable rights” that they’ve read about but can’t quite remember where or when. One question I like to ask Americans when they talk about oil is this: When do you think oil production in the U.S. will reach a peak? Most everyone guesses many years into the future, with five years from now being about the lowest figure that I’ve gotten in reply. When you tell them it peaked in 1970 they are generally dumbfounded or think you are just kidding. If you want to carry this a step farther, ask them what they think the population of the U.S. was in 1970–they probably won’t have a clue, but it allows you to point out to them that even though oil production peaked in the U.S. in 1970 and has declined ever since, we have subsequently added another 100 million people to the nation, which is one of the reasons that we so desperately need to import oil in huge quantities, no matter what. In 2007 the U.S. consumed an average of 20,697,540 barrels of crude oil per day, but produced only 8,487,080–an average shortfall of more than 12 million barrels per day, which had to be imported. When Senator McCain tells you that he wants the nation to be energy-independent, make sure that he can tell you how he is going to do that. If we could double our production of crude oil, a physical impossibility no matter what stories you hear about ANWR or the California coast, we still would be far from oil independence. Where is the straight talk? Americans think of themselves as a fair people, but seem unbothered by the notion that though we have just under five percent of the world’s population, we consume about 25 percent of the world’s crude oil. Even President Bush admitted that we were addicted to oil, though he never followed up on that statement or tried to cure us or at least to get us into rehab. With the price of gas now above $4.00 across the U.S., people are finally beginning to feel the heat–we are not only a nation addicted to gas, we are a nation so dependent on it that we have seldom stopped to think about it. Worse yet, it comes at a time when house prices are falling thanks to a pathetic runaway abuse of subprime mortgages and other unreal fiscal irregularities, which created first an amazing housing bubble and now a drastic removal of air from it. With respect to the intertwined problems of global warming and our profligate use of fossil fuels, neither presidential candidate has stood up and told Americans the truth: The lifestyle that we have today is not sustainable. Energy expert Vaclav Smil noted recently that “Today there is no readily available non-fossil energy source that is large enough to be exploited on the requisite scale.” Richard Heinberg recently wrote that “Addressing the core of the problem means letting go of growth; in fact, it means engaging in a period of controlled societal contraction characterized by a stable or declining population consuming at a per-capita level far lower than is currently taken for granted in the industrialized world.” This message may be much closer to the truth than anything current politicians are saying, but we can’t remain in denial. In 1949 Aldous Huxley wrote that “The human race is passing through a time of crisis, and that crisis exists, so to speak, on two levels–an upper level of political and economic crisis and a lower level crisis in population and world resources.” Almost sixty years later his words still ring true, and we are still living in denial. Sure, people are adapting, and that’s very good. Abandoning their gas guzzling old trucks, eating less meat, going out less, carpooling, cutting down on purchases, cutting down work days, moving to jobs closer to home. What infuriates me is the indifference from the powers in charge, who are doing nothing to minimize their citizens’ pain. Mostly, I want to see bus routes set in place, so that life does not become so hard on Josephine and her family. Is that too much to ask?